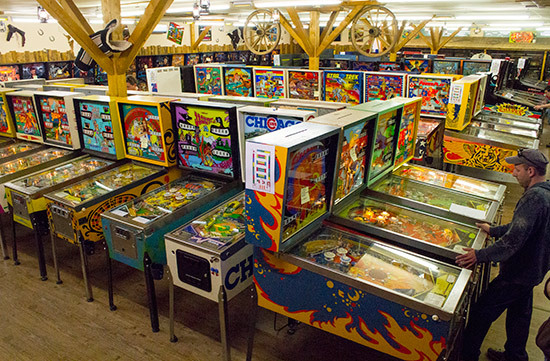 Location: Freddy's Pinball Paradise, Echzell, Germany. 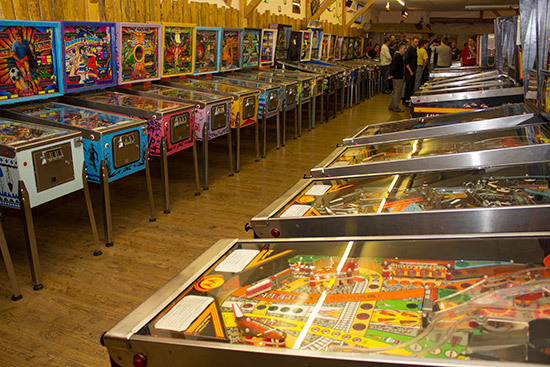 Germany is the host for this year's IFPA World Pinball Championship and the venue is Freddy's Pinball Paradise in the town of Echzell. 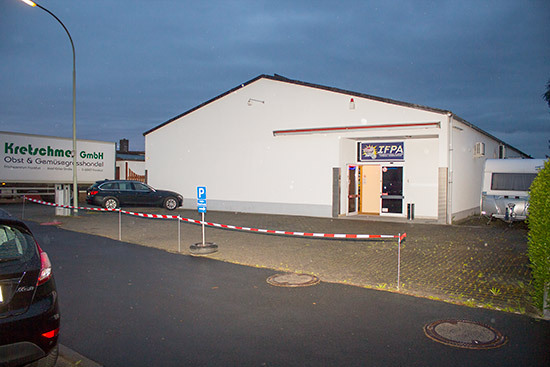 Freddy's is a rather nondescript white building where the only evidence of the events to come over the weekend is an IFPA banner over the entrance. 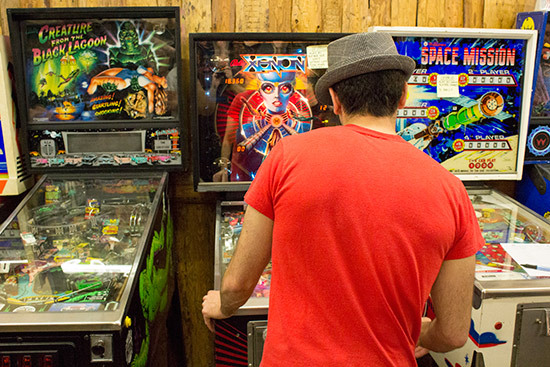 Inside, the hall is packed with games everywhere you look. 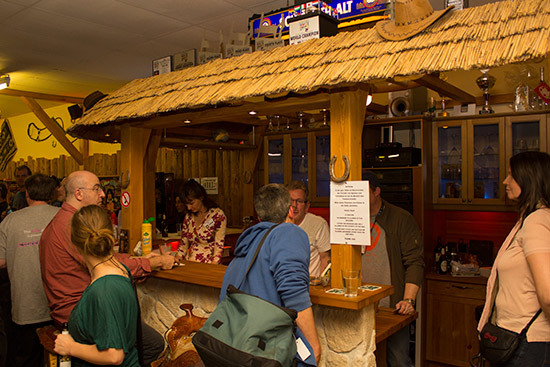 At the rear of the hall is a refreshments hut, serving soft drinks and beer, along with tea and coffee. 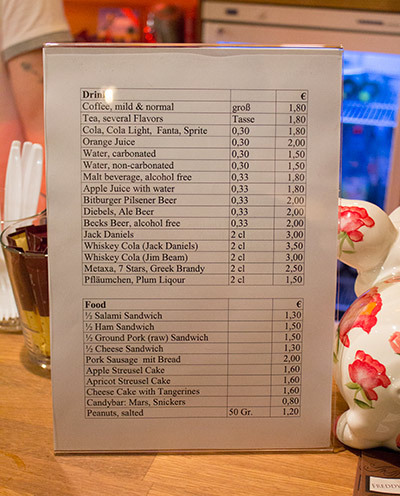 In addition, they also offer open sandwiches, hot dogs and a few other snacks. 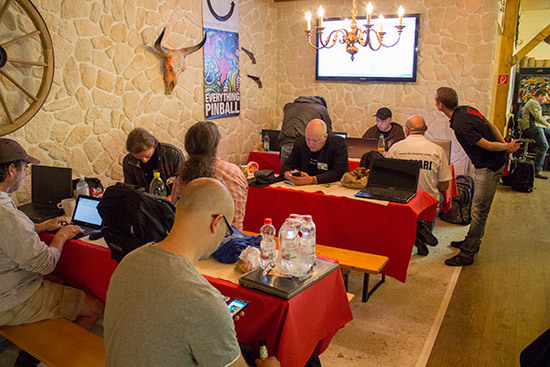 An adjacent seating area provide a space for competitors to eat, drink or update their online status. 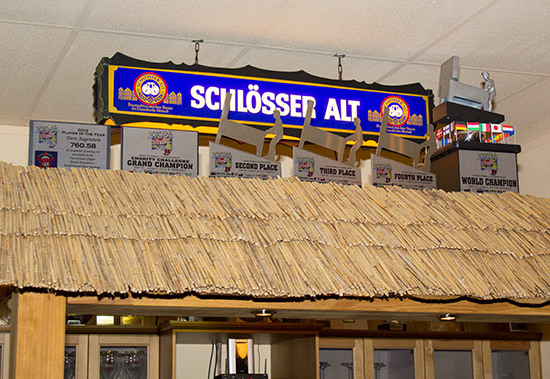 On top of the refreshment hut were the trophies for the top players in the tournament. Although the tournament itself doesn't start until 9am on Friday, Thursday brought a one hour practice session from 6pm until 7pm, the opening of the Charity Challenge side tournament, and the inaugural Epstein Cup - a battle between the eight top-ranked players from Europe and their eight US counterparts. 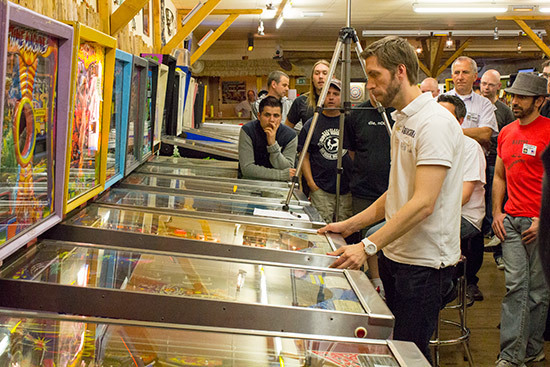 The Epstein Cup began at 8pm with games being chosen by both sides. After a couple of hours of play, with a score of 127 to 107 it is team Europe who win the first ever Epstein Cup. Friday began much as Thursday had finished, with the rain falling and the wind blowing outside. 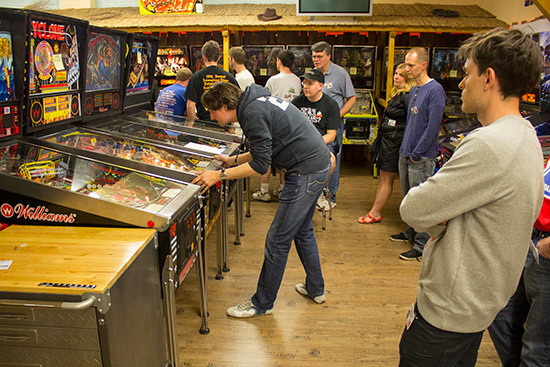 The tournament began at 9am when all 64 players were scheduled to assemble at Freddy's for the first session of the day. 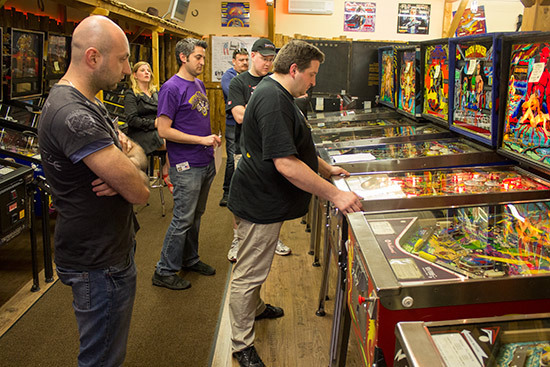 At 9:00am, many of the players had turned up to start playing, but it took until 9:30 before everyone was there and the announcements of the rules and the grouping could begin. There would be six rounds played today - two before lunch, two after lunch and two more in the evening. 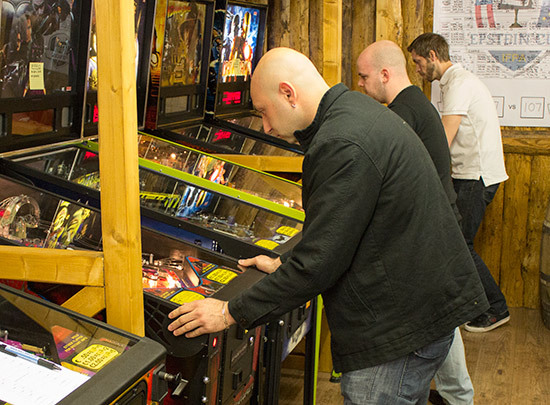 Each round consisted of three 4-player games played on different machines each time. 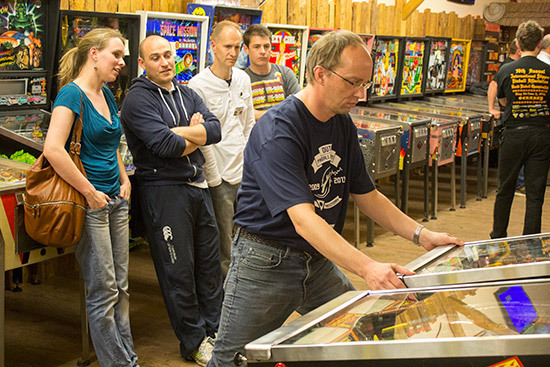 The winner of each game scored 7 points, second place scored 5 points, third got 3 points and last place received 1 point. 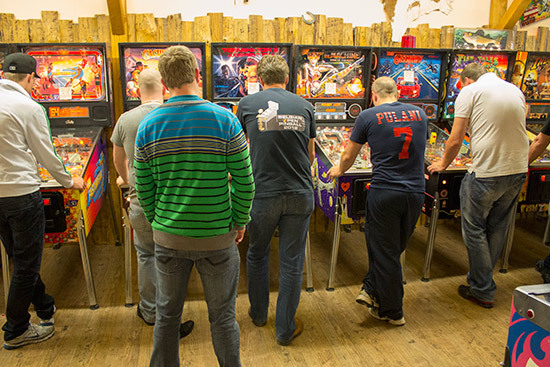 After all three games had been played, the points were added up and sent to the organisers' desk. 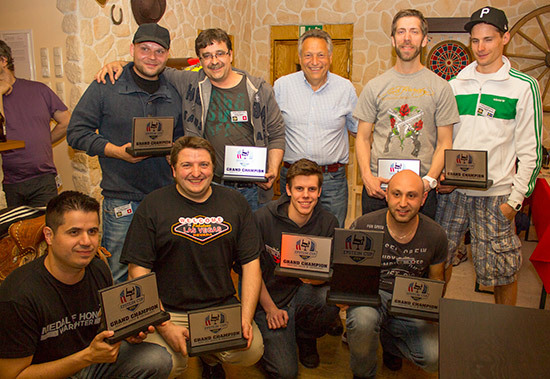 The 64 players were ranked according to their WPPR points total and the first 4-player group was made up from: the highest-ranked, the lowest ranked and the two middle-ranked. These players were then removed from the ranking and the same selection made to generate all the other groups. 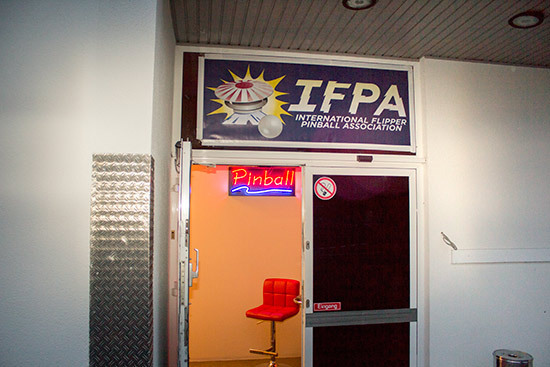 After each round, the points scored by each player were shown on video monitors located around the building, and on the IFPA website. Once the first round had been played, the WPPR ranking was abandoned and the total of the actual points earned were used to make up all subsequent groups. 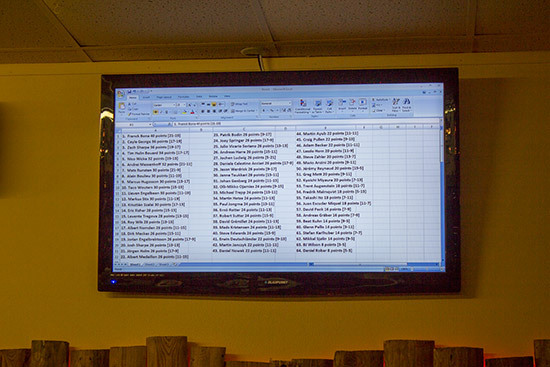 After two rounds had been played, the 64 players were split in two for group-making purposes. So the first group consisted of players in positions 1, 16, 17 and 32 and the next group had players in positions 33, 48, 49 and 64. Further subdivisions took place later in the day to make sure players of broadly similar skill levels were playing together. Ultimately though, it was the number of points earned which would decide which 32 players would go through to the next stage. 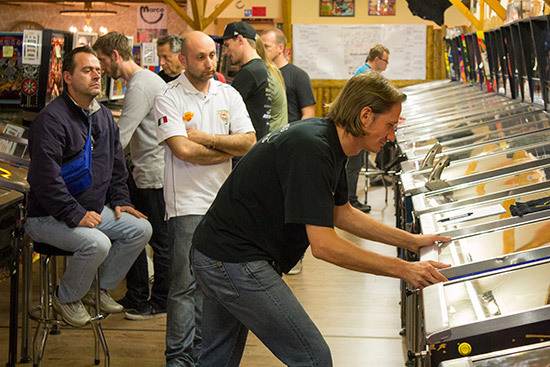 Between rounds, six practice machines were available at a cost of €1 per game, paid using an honour system at the organisers' desk. 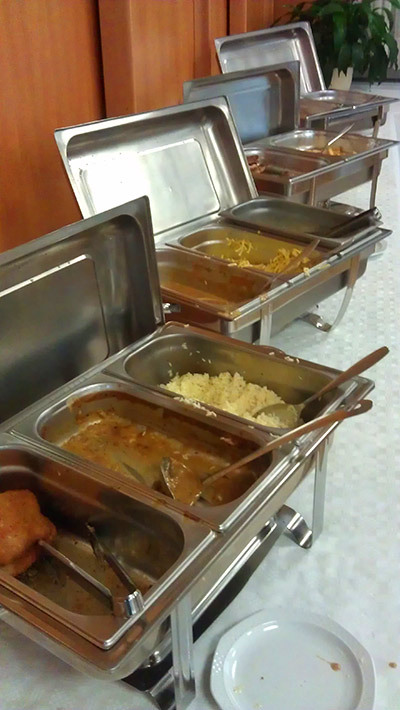 On Friday and Saturday evening, a buffet dinner had been organised at a restaurant and beer garden just over the road. The dinner cost €20 per day and consisted of several different meats - chicken in almonds, breaded pork steak, beef goulash, sausages, etc. along with rice, french fries, mixed vegetables and a salad selection. Friday's six rounds were all completed around 1am, making it a long day of play for the competitors. 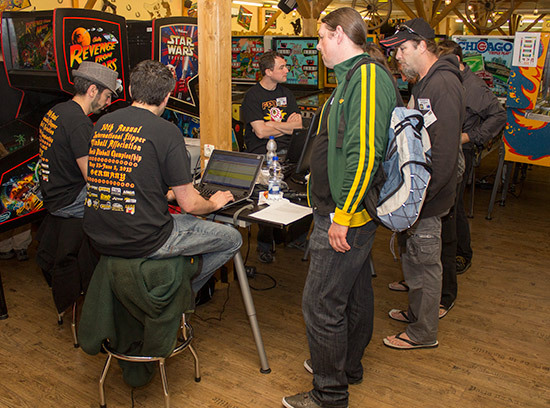 Another two rounds took place on Saturday morning, before the top 32 moved on to the next stage. 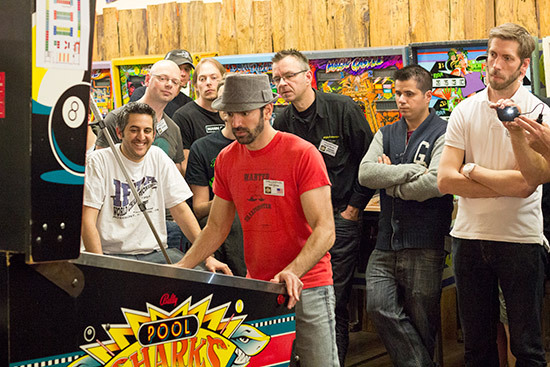 The remaining 32 competitors were then out of the tournament. The top 8 players get two byes through the following rounds, the next 8 get one bye. The remaining 16 started their head-to-head best-of-six matches immediately. 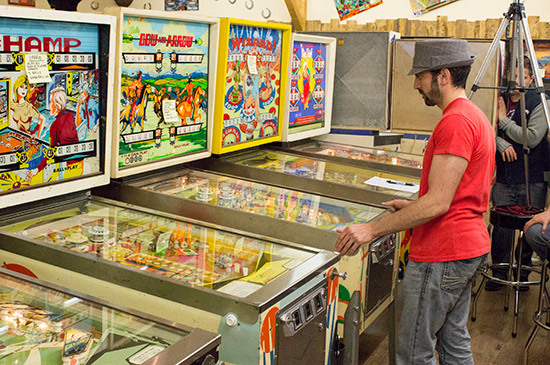 Each player could choose one machine from the three categories of old, middle and new, and the first to record four wins continued to the next round. 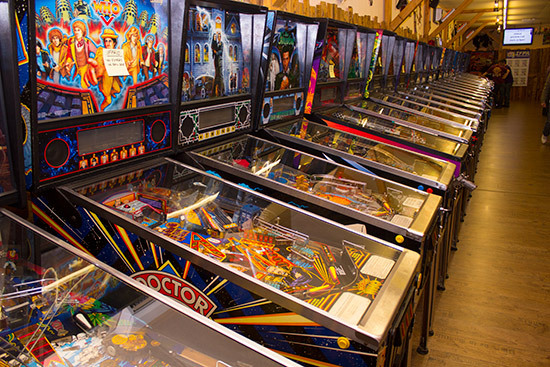 In the case of a tie, three more machines were chosen to decide the winner. 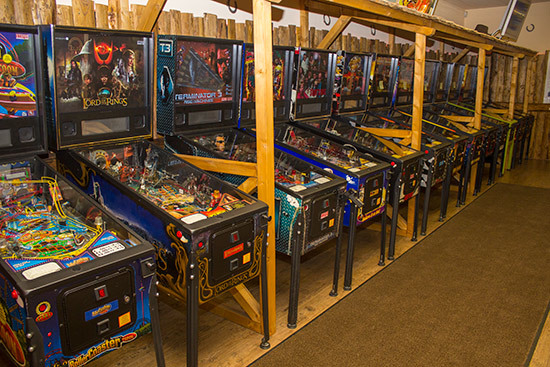 Here's a look around Freddy's Pinball Paradise during those second round matches with our exclusive Four Minute Tour. The third round of matches introduced the eight top qualifiers to give the final sixteen players. 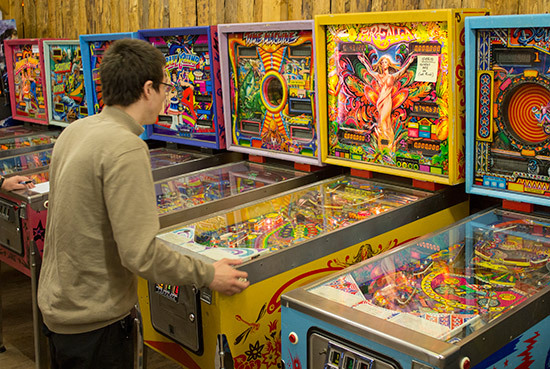 These matches continued the head-to-head best-of-six format with each player choosing three machines. They would compete in the quarter-finals which began at 10am on Sunday morning, with Zach playing Julio, Daniele playing Jérémy, Jörgen playing Paul and Nico playing Tim. After the quarter-finals, just four players remain. 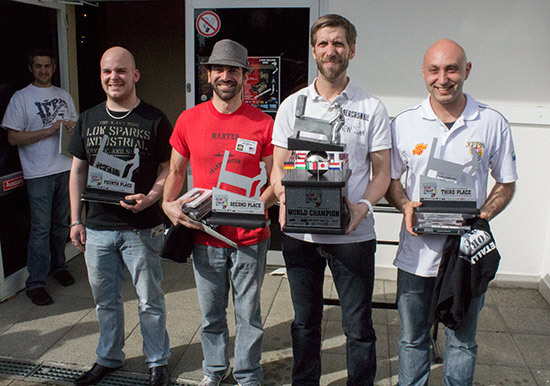 Zach beat Julio, Daniele beat Jérémy, Jörgen beat Paul and Nico beat Tim. 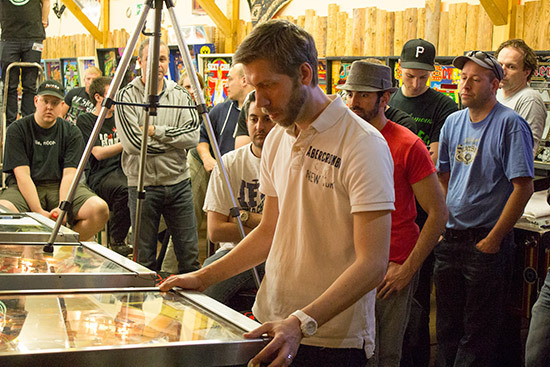 And Jörgen Holm is the first player into the final, as he beats Nico Wicke in the first semi-final. 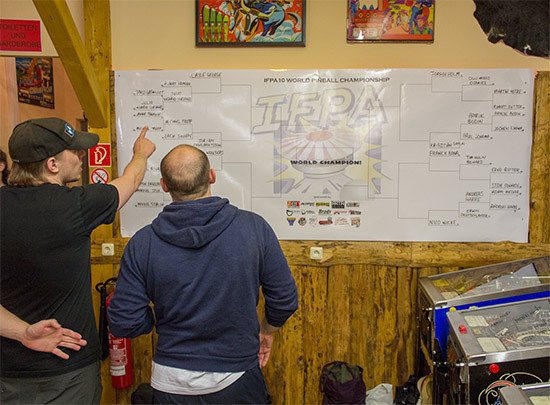 And we will have a new IFPA World Champion as Zach Sharpe beats Daniele to join Jörgen in the final, winning by 4 games to 1. 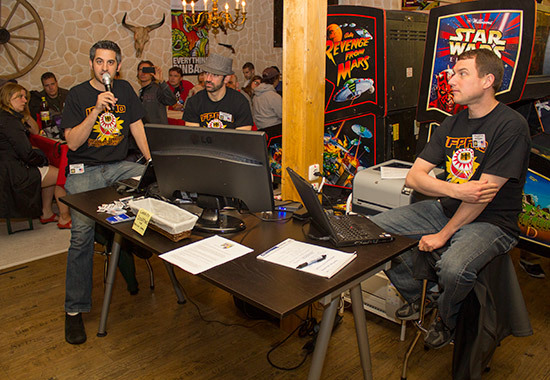 So, we're on to the final and first blood is to Zach as he beats Jörgen by a narrow margin of 284,630 to 251,530 on Xenon. 1-0 to Zach. The second game is Avatar and this time it is Jörgen's turn to take the honours by 20,694,870 to 11,439,990, levelling the score at 1-1. Game three is on Indianapolis 500, and it's an easy win by 319,409,110 to 264,761,670 for Zach who didn't need to play his last ball and now leads 2-1. Game four is on Earthshaker! 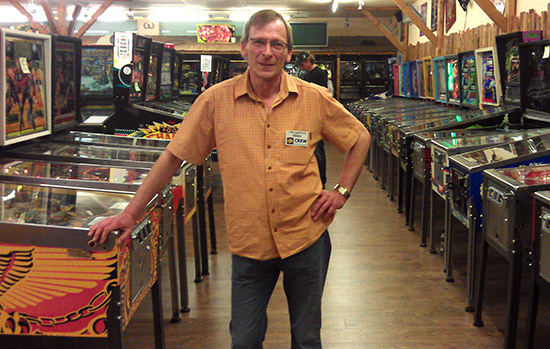 and thanks to a great first ball with multiple multiballs and jackpots it goes to Jörgen by 14,497,080 to 5,765,590 with his last ball unplayed. So the score is now 2-2 as we move to game five, Fireball. 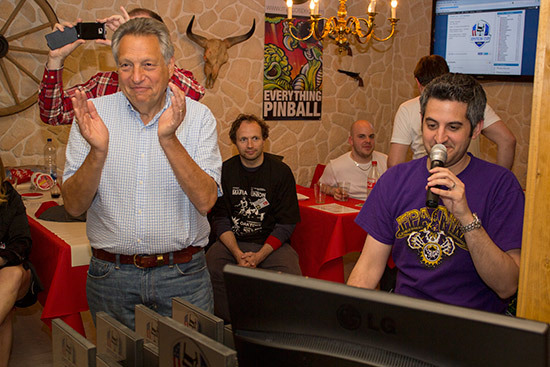 Fireball was a success for Jörgen as his 115,580 five ball score beat Zach's 70,440 to put him in the lead 3-2. 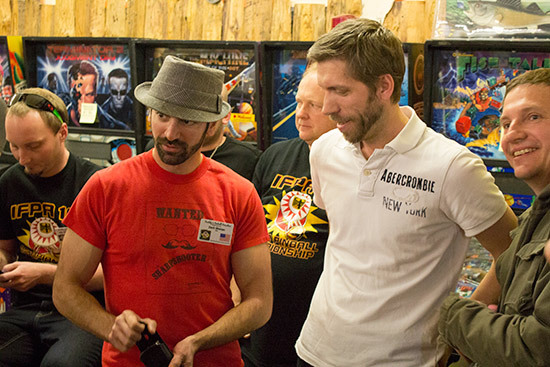 The sixth game could be the winner for Jörgen or the tie for Zach. Let's see what happens as we stay with the EMs and Bow and Arrow. And what an exciting game it turned out to be. 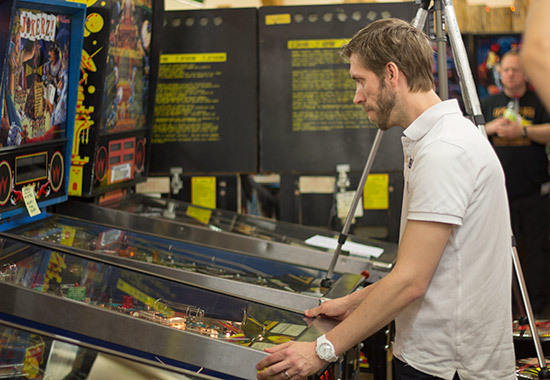 Zach played first and put up 127,430 but Jörgen couldn't quite reach it, ending on 114,100 and making the score 3-3. So now we have another three games to enjoy, with the first to two wins becoming the champion. And first blood goes to Jörgen on Farfalla as his score of 3,589,960 proves unassailable with Zach ending up on 188,070. 4-3 to Jörgen then as we move onto the next game - Pool Sharks. This ding-dong battle swings back the other way as Zach wins on Pool Sharks to make it 4-4. So the ninth game of the final will be the decider, and it will be contested on Harlem Globetrotters. 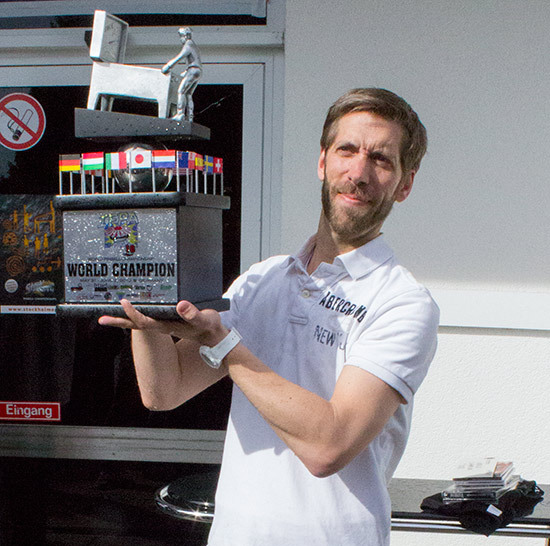 Even this could barely separate the two, but in the end it was Jörgen who won the game and the final by 30,000 points with 290,040 to 259,550. 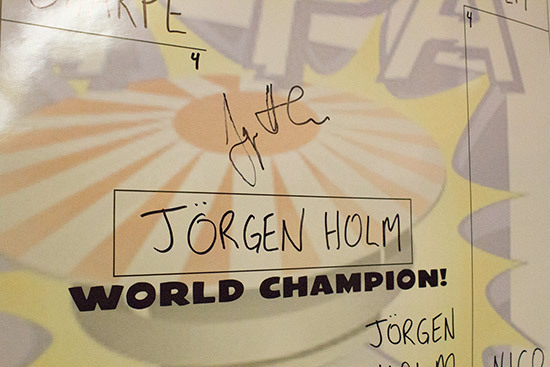 So Jörgen Holm is the new IFPA World Champion after a gruelling nine game final. 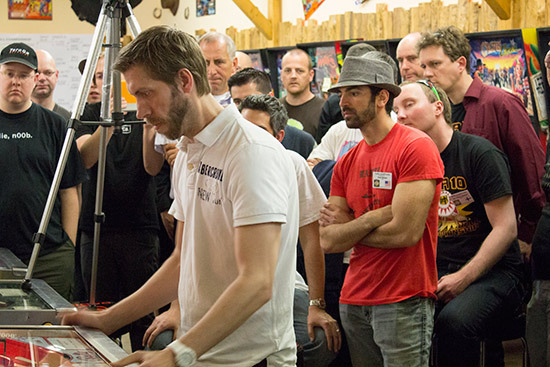 Meanwhile, in the play-off for third place, Daniele beat Nico by two games to nil. 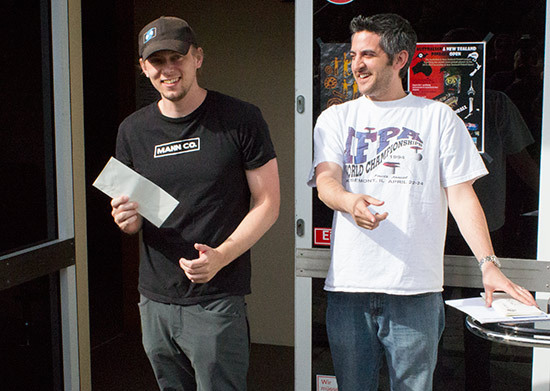 The awards ceremony took place outside the building shortly after the final ended. 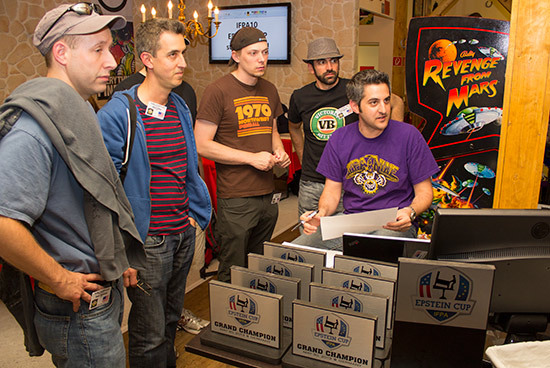 Running alongside the main tournament was a side-tournament, the Charity Challenge where a €20 entry got you a single play on three machines. They were Monster Bash, Kings of Steel and Dogies. 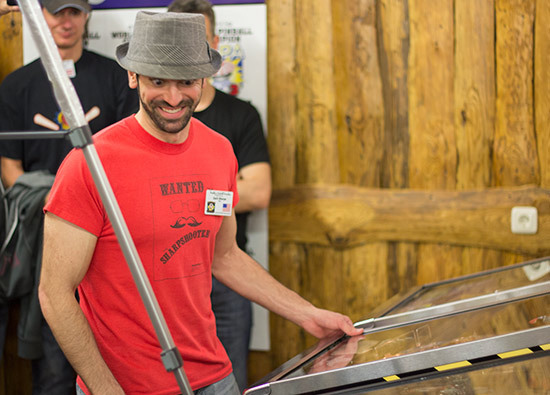 The entry fees were split 50-50, with half going to the chosen charities of Midwest Athletes against Childhood Cancer and Kids Fight Cancer, and the other half making up the prize money for the top four ranked players. 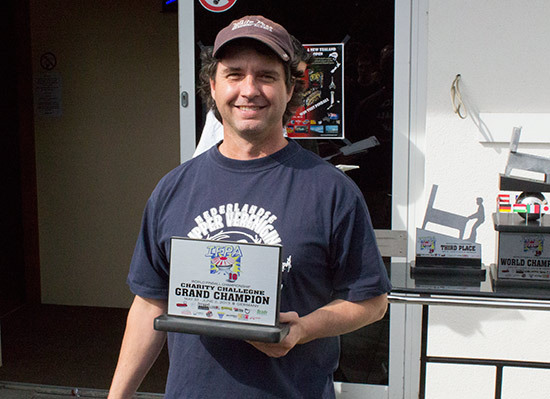 The overall winner was Trent Augenstein who won 40% of the half the money used for prizes - which seemed to be around €130 - plus a trophy. 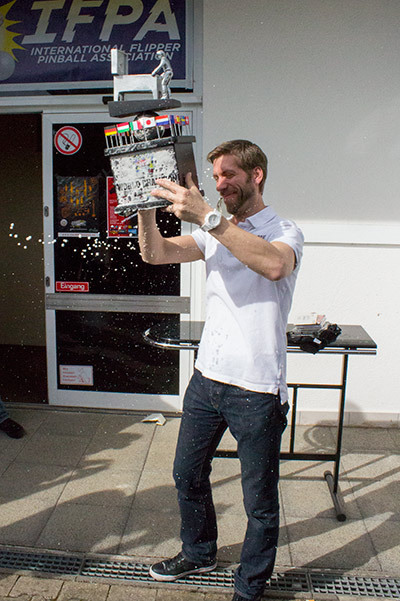 After the awards, everyone went back inside to continue playing and socialising, while Jörgen signed the progress poster. 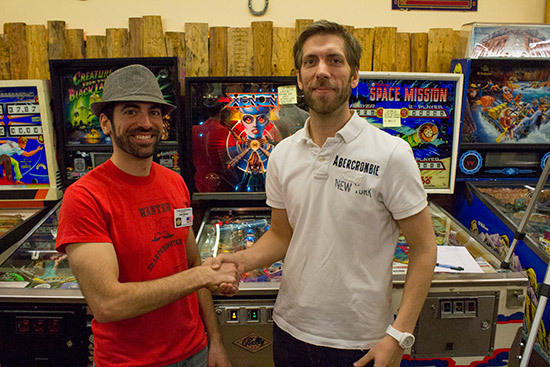 And that brings to an end our coverage from Freddy's Pinball Paradise of the 2013 IFPA World Pinball Championship. 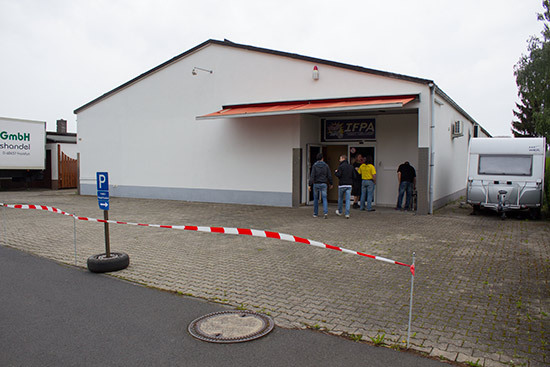 Full rules and a round-by-round breakdown of the results are available at the IFPA website.